Stacia Woolverton is a little stick of dynamite working at the communications office within the Agency for Persons with Disabilities. The 40-year-old was born with de Morsier syndrome or Septooptic dysplasia, which typically affects a person’s vision and pituitary gland. Woolverton is a knowledgeable call center representative. 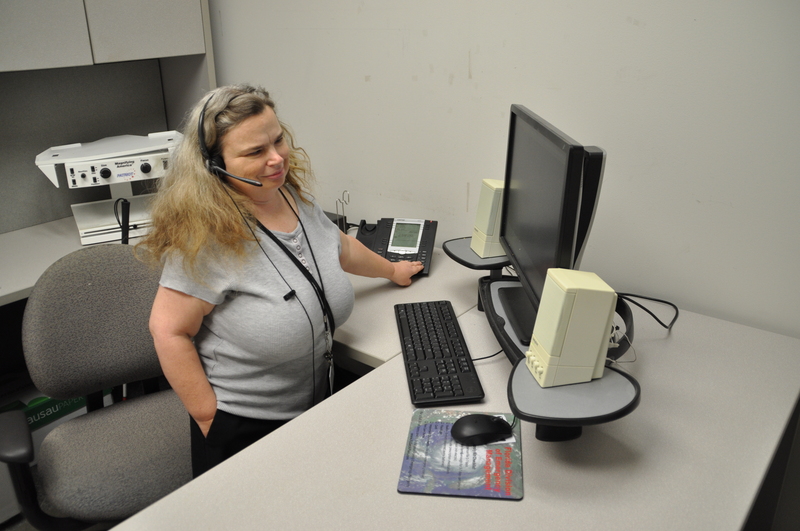 She provides information about the agency and other disability-related information and resources to those who call in or email the agency, along with agency’s staff. She also provides Braille and large print for those who are visually impaired and attend meetings. Supervisor Lindsey Boyington said Woolverton is always willing to go above and beyond. Giving hope to frustrated callers who have not found the answer they are looking for is her main goal. Woolverton strives to become more knowledgeable of the agency’s policies and procedures. She knows that will aid in becoming a better guide for someone navigating the complex system of resources. She loves being the one to find the right answer for a customer and sometimes they even call her back to thank her for her assistance. When asked what she likes best about her job, Woolverton said, “I feel accepted and appreciated. I love my job because I am making a difference in the lives of the people I serve. APD supports people with developmental disabilities to live, learn and work in their communities. The agency annually serves more than 50,000 Floridians with autism, cerebral palsy, spina bifida, intellectual disabilities, Down syndrome and Prader-Willi syndrome. For more information about the Agency for Persons with Disabilities, visit APDcares.org or call toll free 1-866-APD-CARES (1-866-273-2273).